Messiaen said he wanted "shimmer of sound" and "halo of trills." These performers delivered. 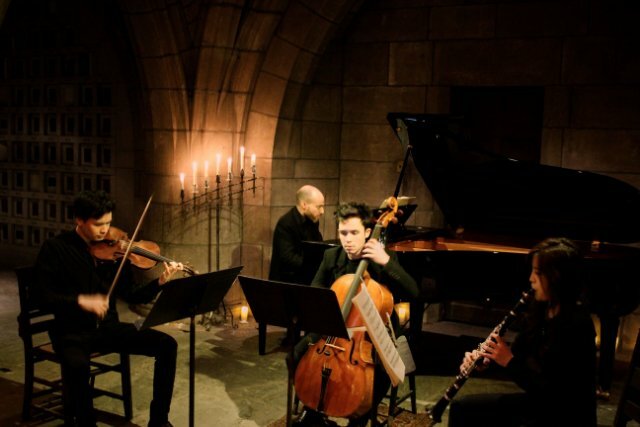 Sounds swirled in Messiaen's solitary silence and were brought to life at The Crypt. 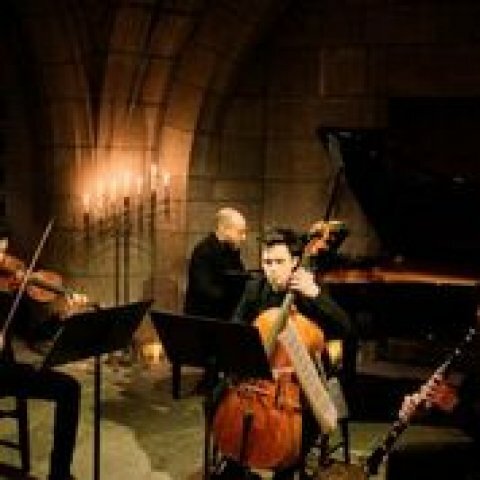 Musicians rise to the extraordinary challenge of Messiaen's Quartet. Stefan Jackiw makes sound where there is none. Andrew Ousley’s remarkable concert cocktail evenings at The Crypt presented Olivier Messiaen’s Quartet for the End of Time. 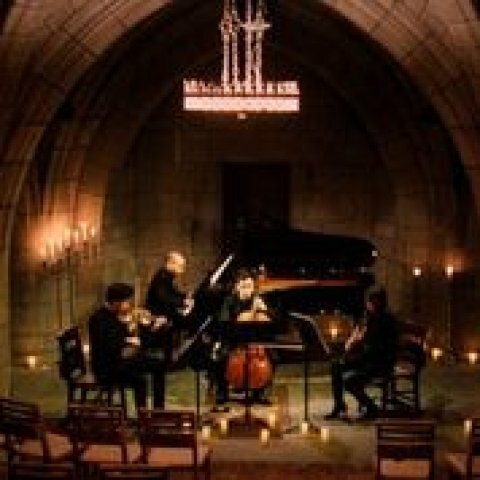 This most famous of Messiaen’s works had a moving performance in a setting that resonated with crystal liturgy. The work premiered in a prisoner of war camp during the Second World War. The last day of spring 1940, the Nazis poured into France. Three musicians running through the woods were captured. Henri Akoka, an Algerian born Trotskyite Jew, clutched his clarinet. 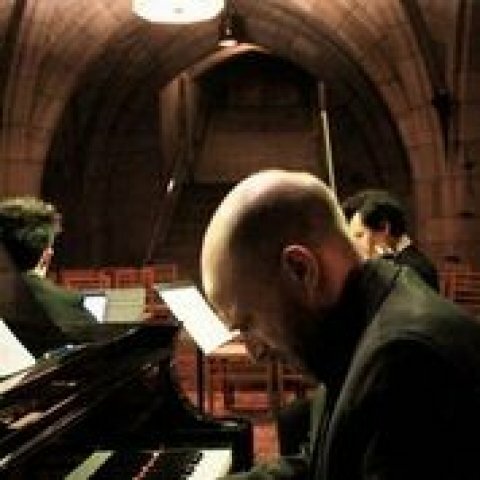 Étienne Pasquier was a well-known cellist and Messiaen, an organist and bird watcher. After capture, the men walked for days without food or water. Messiaen composed “Abyss of Birds,” a solo for clarinet. Akoka said it was too difficult for him to play. Yet he did. During the difficult months that followed, the musicians were treated particularly well. After all, for Germans, music is music. The cellist was given a kitchen job. A sympathetic guard puts Messiaen in solitary, provided with staved paper and pencils. Messiaen would later say he was not a prisoner, because he was composing all the time. 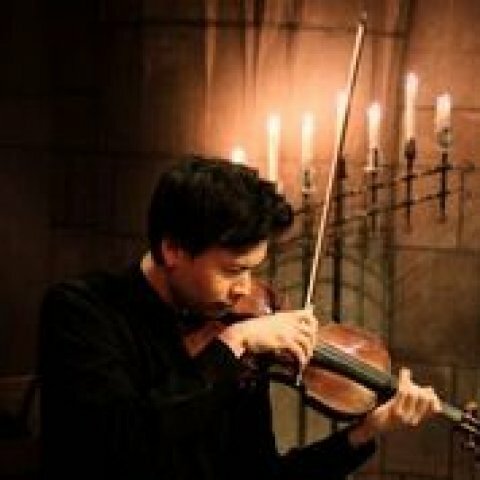 At The Crypt, Yoonah Kim on clarinet channels the song of a blackbird, as Stefan Jackiw joins as a nightgale on violin. Jay Campbell on cello loops through spectral harmonies and on the Yamaha piano, Orion Weiss cycles through various rhythmic values on a myriad of chords. The piece is divided into eight parts. The composer explained to the first audience that the first sections were the six days of creation. The seventh was the Last Day. The eighth, The End. Sometimes the violin and cello are in a unison chant. At others, chords crash. The pianist can create waterfalls as he descends the keyboard. The third movement is the ‘Abyss of Birds,’ composed as Messiaen walked. Birds are the opposite of time. They feel like our desire for light and stars as Kim plays. She chirps and trills. Her crescendos miraculously swell from silent to shattering. A little music box trio suggests a period before the war. It is a trifle. In a fevered dream, Campbell rides the waves of the piano on his cello, endlessly wandering. Each spring chord suggests a new color. Jolting cadences and jagged lines are created at the instruments chase each other around. The end of The End comes as Jackiw on violin plays above the throbbing piano. The melody stays on, but it has been burned in the crucible of war. The violin rises. The piano climbs. We are immobile, beyond patience and hearing. The spectral harmonies and bird like rhythms have ceased. We are captives in silence. 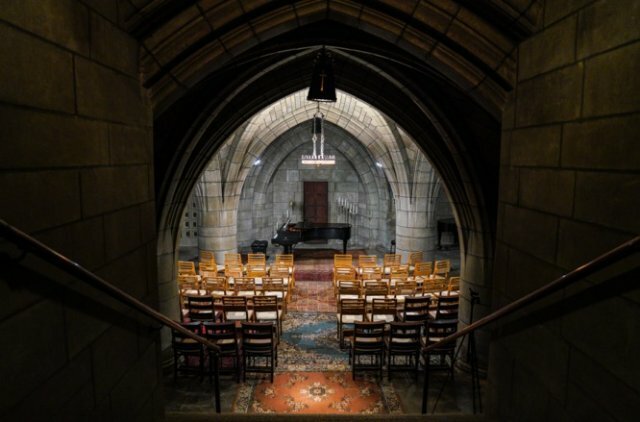 This was an extraordinary musical experience in a special place. The performers were out of this world.